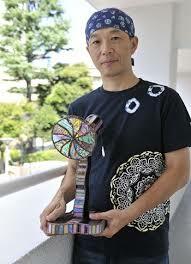 Koji Yamami is an award winning Japanese kaleidoscope artist who studied art and design at Santa Monica College in California in the 1980's and began handcrafting kaleidoscopes upon his return to Toyko. Koji mainly creates limited edition stained glass kaleidoscopes and other one-of-a-kind scopes, however he also works with a Japanese aluminum maker in creating an affordable line of aluminum scopes with superior quality. In addition, Koji collaborates with Arita porcelain artisans in producing kaleidoscopes and teleidoscopes, combination Japanese traditional craft and modern kaleidoscope art. He is also very active in promoting the wonderful world of kaleidoscopes not only in Japan but around the world and shares his passion by teaching the art of kaleidoscope design in his stained glass studio.